A lubricant’s viscosity is generally considered one of its most important properties, and with good reason: If the viscosity of a lubricant is even modestly different from what is needed for a particular component and application, the lubricant will not be able to lubricate the component effectively. This may lead to significant damage and possibly equipment failure. Understanding viscosity is important for proper lubricant selection and management, and ultimately for maximizing the performance, efficiency and life span of your equipment. Below are answers to some common questions about viscosity that may shed some light on this complex yet vital aspect of lubrication. A: Viscosity is a fluid’s resistance to flow at a given temperature. The greater the resistance to flow, the higher the fluid’s viscosity. Q: What are absolute viscosity and kinematic viscosity, and what is the difference between them? A: Absolute and kinematic represent the two methods for measuring and reporting viscosity. Absolute (also known as dynamic) viscosity measures a fluid’s resistance to flow when the fluid is subjected to a controlled force, such as a moving machine part, pressurized air or a pump. The more force required to move the fluid, the greater the fluid’s absolute viscosity. For example, it takes more force to mix yogurt in a blender than to mix fruit juice because yogurt has a higher absolute viscosity. Kinematic viscosity, in simple terms, measures a fluid’s resistance to flow under the force of gravity. The slower the fluid’s flow in relation to gravity, the higher its viscosity. For example, if you were to tip over open containers of honey and water, the honey would pour out more slowly because its kinematic viscosity is higher. Q: Does a fluid’s viscosity change in relation to the rate of shear stress (i.e., how rapidly or slowly the fluid is stirred, pumped or otherwise forced to move), or is the viscosity constant? A: The answer depends on the specific fluid. Most fluids maintain a constant viscosity regardless of the pace at which the fluid is forced to move. Those fluids are known as Newtonian fluids (because they adhere to Sir Isaac Newton’s law of fluid mechanics). For Newtonian fluids, absolute viscosity is constant, as is kinematic viscosity, and the two measurements are relative to one another. Most lubricant oils are considered Newtonian. With some fluids, known as non-Newtonian fluids, the viscosity varies with the rate at which the fluid is forced to move. Mayonnaise is a good example: It has a high viscosity when subjected to the relatively low shear of gravity (i.e., an open jar of mayonnaise does not readily spill out if the jar is turned on its side). But when stirred, mayonnaise yields very easily to the force. It’s viscosity decreases as the shear rate (the velocity of the force) increases. Q: If most lubricant oils are considered Newtonian, which lubricants fall into the non-Newtonian category? Q: Can a lubricant’s viscosity change due to other factors? A: Yes. The viscosity of a lubricant (regardless of whether the fluid is Newtonian or non-Newtonian) fluctuates inversely with temperature — which is why temperature always must be reported with viscosity measurements. A lubricant’s viscosity also can be altered by contamination, oxidation, thermal degradation, or by improperly mixing the lubricant with another lubricant of a different viscosity (higher or lower) or with a solvent. Regular oil analysis is critical to monitoring a lubricant’s viscosity and other aspects of its condition. Q: How is viscosity measured? A: Various types of instruments called viscometers are used to measure viscosity. Many viscometers measure the time it takes for a fluid to pass through a capillary tube under the force of gravity (in the case of kinematic viscosity) or a controlled external force (in the case of absolute viscosity). Kinematic viscosity is usually measured in units called centistokes (cSt). It is common to measure the kinematic viscosity of industrial lubricants in centistokes at 40°C (104°F) because that is the basis for the ISO 3448 kinematic viscosity grading system — a globally accepted industry standard established by the International Standards Organization. 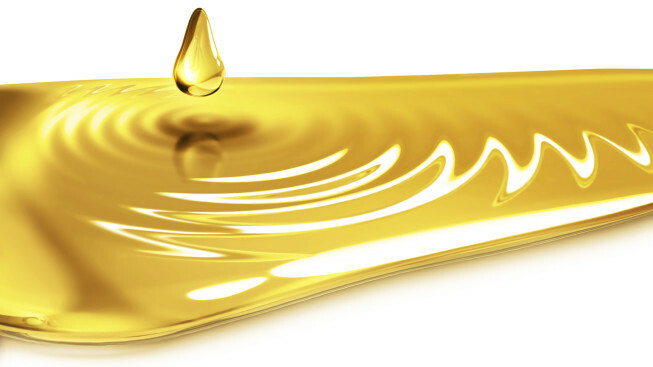 For some lubricants, especially those designed for automotive use, kinematic viscosity is typically measured in centistokes at 100°C (212°F) in accordance with the SAE J300 grading system — the international standard set by the Society of Automotive Engineers. Laboratories usually measure and report the kinematic viscosity of a lubricant. If absolute viscosity is measured and reported, the unit of measurement is the centipoise (cP). Q: What is viscosity index? A: A lubricant’s viscosity index (VI) is a unitless number that indicates the viscosity’s stability in relation to temperature changes. The viscosity of a lubricant fluctuates inversely with temperature. With some fluids, a slight change in temperature may cause a dramatic shift in viscosity; for other fluids, the viscosity barely changes even with substantial temperature fluctuations. The higher a lubricant’s VI, the more stable its viscosity is over a wide range of temperatures (i.e., the less it changes with temperature). VI is often an important consideration when selecting lubricants for applications experiencing wide temperature variations. Q: What problems may occur if a lubricant’s viscosity is too high or too low? Q: What is the best way to select and maintain proper lubricant viscosity in a system? Consult lubrication experts to select the proper product for your specific component, application and operating conditions. Use ongoing oil analysis to keep tabs on the lubricant’s condition, including its viscosity. Isel makes lubricant selection and maintenance easier for you. Isel designs and manufactures industry-leading lubricants that offer unsurpassed performance, protection and service life. Our lubrication expertise and unique manufacturing processes allow us to customize formulations to your customers’ specifications, so you can provide them with the exact viscosity and other properties that their systems, applications and operating conditions demand. Isel also offers a complimentary oil analysis program that is available to all of your customers who use Isel-manufactured lubricants for as long as they use them. With Isel’s thorough understanding of viscosity and other lubricant properties, as well as our expert analysis services, you can help your customers maintain proper lubrication and equipment protection. For more information about Isel’s products and services, contact us today.